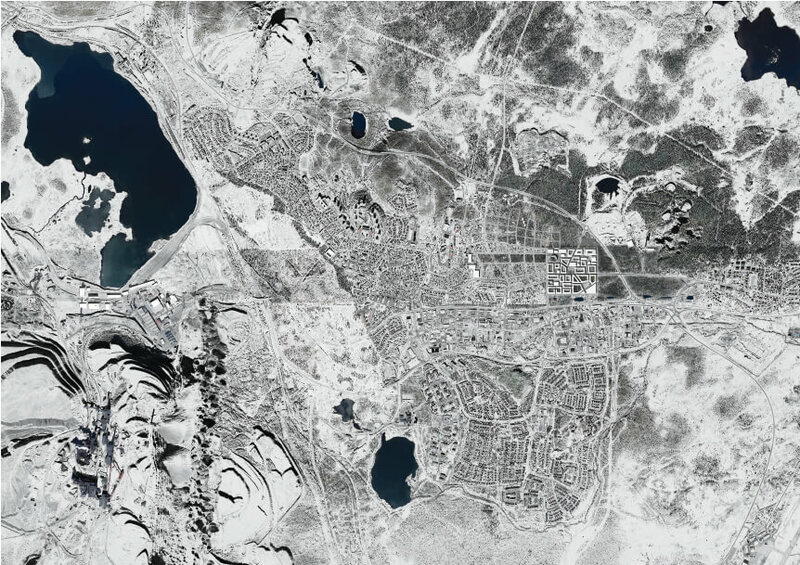 New Kiruna – competition entry 2015, in collaboration with Territorial Agency and A-zero Environmental Architects. The proposal uses available land as well as existing and planned infrastructure to establish a new and dense urban settlement. 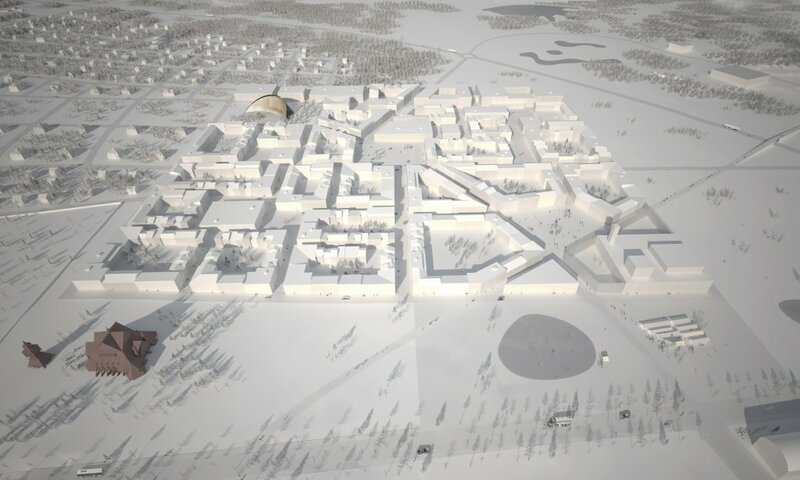 This would allow Kiruna to escape from being a town depending so heavily on the visual reference to the mine and instead become an urban place in its own right. The proposal also corresponds precisely to the need for new and relocated building mass to secure the realization of the vision. With a clear geometry and overall shape the new city center – the Citadel – orders the surrounding landscape into a series of functional spaces. A large entrance place is established on Malmvägen to the south, with direct access to the new City Hall and the church park. To the west and northwest it is linked to existing residential neighborhoods with a mix of relocated historical buildings and new housing. A continuous green belt is defined along the new E10 and functions as a buffer zone between city and highway, and also as an intermediary link to the wild nature and recreational areas further north. The Citadel is connected to the surrounding residential urban and green areas with the help of a number of roads / main thoroughfares. They pass through the city center, and naturally guide the movement to and through the main public places and squares. This creates the basis for a simple orientation within the city where then smaller streets and places add depth and variety within each block. A uniform height of three storeys (10m) is complemented by a number of higher buildings that act as vertical points of orientation; primarily holding public programmes, the city’s cornerstones: the City Hall, the Sami Parliament, and the Health and Education area. Three plazas form natural communities within the citadel, connected to the main public functions; Civic Square, Town Square and Culture / The Parliament’s place. In addition, the entrance square, an initial reference point on the way into the city, also offers an open platform for various activities, markets, recreation, exhibits, etc. The structure of the city core is based on a carré typology and a simple grid which, through its generality provides durability over time. The resulting network has then been modified, and given a rhythm and variation while adapting to local topography and directions. It is designed to meet the specific environmental and climatic challenges that northern latitudes represent. Shelter from strong winds and maximizing of natural daylight have been important factors. Grid City’s dense and urban qualities enables to provide vivid and secured street space that is enhanced by the possibility of varying patterns of movement within the city center. The general and transparent quality of the grid is also well placed to deal with parking, removal of snow and other aspects that support a dense city. Through its compact layout it also constitutes a good basis for an energy efficient and sustainable new city in the North.